Entrepreneurs combine the basic productive resources (natural, human, and capital) to produce goods and services they expect to sell for a price high enough to cover production costs and earn a profit. 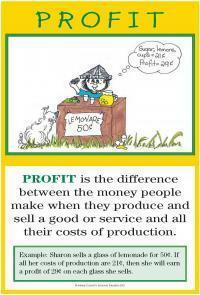 Profit is the amount remaining after all costs of production have been subtracted from sales revenues. Starting a business is difficult and risky, and making a profit is never guaranteed. Entrepreneurs must spend money and use resources to produce a product before consumers decide whether they will purchase the product at a price high enough to cover production costs. There are many business challenges and responsibilities, including hiring and paying workers; earning enough money to pay taxes, suppliers, and anyone else involved in the production process; and complying with government regulations. Entrepreneurs will produce goods and services only when the expected profits are high enough to make the risk incurred in production worthwhile. Wages and employment opportunities at a business depend on its success in earning profits and avoiding losses. Similarly, public policies that affect the profitability of a business affect not only the owners and employees of the business, but also the consumers who buy the products produced by the business. Read children's books about entrepreneurs. Identify entrepreneurial characteristics of the books' characters. Also identify what motivated the entrepreneurs to take the risks to start a business. List some of the costs of operating a pizza restaurant. Identify and discuss ways that a pizza restaurant might increase its profit. Have groups of students write "Find the Profit" math problems. (e.g. If the sales revenues are $14.85 and all production costs are $10.75, what is the profit?) Assign the problems for a math assignment. Write a paragraph entitled, "Why It Is Important for a Business to Make a Profit." Draw pictures to accompany the paragraphs and make into a bulletin board. Interview an entrepreneur to learn why he or she was willing to start a new business. Lesson 13: Costs and Profits - It is best to do Lessons 11 and 12 first. In these lessons, students make products using modeling clay.